Zhanjiang information: a lot of requirements regarding your stay, included instructions about tours and convenient solutions for hotels and rooms arrangement. 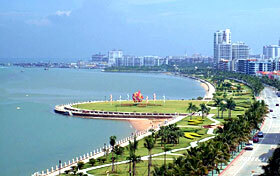 Hotels: Zhanjiang and China reservation service, discount hotels at budget prices. Travel: you can update about Zhanjiang tours to discover the main highlights and to visit the famous tourist lands in the surroundings. Zhanjiang lies in the southernmost of China's Mainland, the southwest of Guangdong Province, the east is close to the South China Sea, opposite Hainan Province and separated by Qiongzhou Strait just, is next to Guangxi in the west, adjoin Maoming of Guangdong in the north. Zhanjiang is surrounded by sea on three sides, there is no severe cold in winter, there is no heat in summer , the coastline is 1935 -km-long, suitable for developing strand scenery bank piece of tourist industry reach more than 150 kilometers. 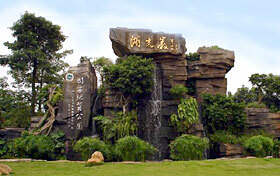 The main characteristic of forming Zhanjiang and travelling is a tropical, subtropical marine scene. Near to give a recommendation scenic spot as follows, good omen gulf, the east island, lake-light rock, South Asia hot to act as the botany, the ancient city of Leizhou, see the sea in the long corridor, the aquatic biological museum, the beacon of Nao Island, the travel resort of east island, the thunder ancestral temple, the peaceful temple of it, three yuan tower, Song imperial city site, the maritime city, the litch garden of east slope, the harbour of Zhanjiang, the bridge park of one inch of gold, the seaside park.